Mike Gundy is reportedly “quietly” pursuing the Florida Head Coaching job. If I am Mike Gundy, I would be loudly pursuing the job, because I believe he has hit a glass ceiling at Oklahoma State. My hat is off to Gundy for making that program relevant again, but I personally do not think he could do any better than Muschamp. He might score more points, but that defense is going to be terrible. Here is the full article on his interest. Many of you were probably watching the Florida State/Boston College game in hopes for FSU to finally lose.. Join the club. In the midst of FSU pulling another win out of thin air, Jamies decided a referee would be in their way of achieving the victory, so he shoved him out of the way. Did he get flagged? Nahh…. He just converted the 3rd down play to keep the drive going. 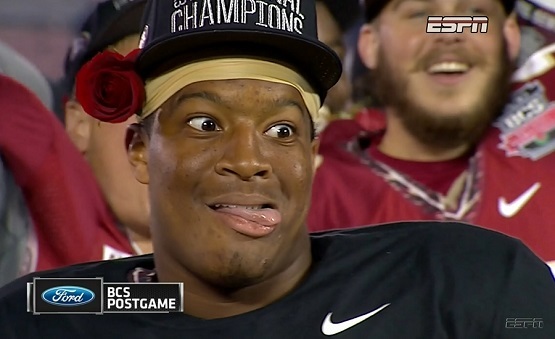 Keep doing you Jameis. Rules or no rules. Here is the video. As we head into the last season of the regular season we rank the top coaches in the SEC. My number one is still Saban, and I am pretty sure he would be number one on everyone’s list. The big question is: Where would Mark Richt rank? He is number two on my list, but we will have to see how he handles the Yellow Jackets this weekend. Here is the full list. Posted on November 24, 2014, in Alabama, Mississippi State, Missouri, SEC, Texas A&M. Bookmark the permalink. Leave a comment.